Nope, the nightlife in Salzburg is tame, lame and relaxed, provincial and unexciting by international clubbing standards. That being said, we like our city without major clubs and bar venues - for the small and cosy bars, pubs and inns. 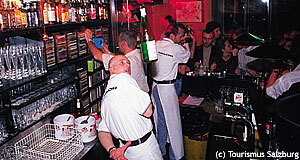 In this article, we will try to give an overview on the rudimentary nightlife of Salzburg. For getting around at night, have a look at our article public transportation. There is a night city bus called NachtStern and a night bus called BusTaxi that departs from various spots in the city centre at every full hour (on weekends until 3 am). Costs 4,50 Euros per ride, regardless of how far you go - the BusTaxi serves the villages in the surroundings of Salzburg. Ask at your hotel, at the Salzburger Verkehrsverbung (public transport company) or at the tourist information office for further details. There are two ways to approach the nightlife issue: Firstly, there are traditional bars and inns, the kind of venues we personally prefer. Some of them are somewhat anti-mainstream or even underground, which is where you might find our editors. Others are ore of the traditional Austrian inn type. Secondly, you can go mainstream and pretend to be in a city with real nightlife - in this case, you will find pseudo-snobbish bars and clubs that look like fancy clubs in the city centre of London, but lack the clientele. Here you will find a mix of law students, other wannabes and new money from both the city and the surroundings villages. Not our preference, but maybe appealing to you. We will not comment on individual venues in this article. The bar and pub scene of Salzburg concentrates on a few areas: Note in particular the Altstadt (Old Town or City Centre). Focus on the Rudolfskai and Giselakai areas (noisy mainstream bars) and Gstättengasse with nearby side-alleys; on the other side of the river, see the northern part of the Steingasse and the Linzergasse, again with the side-alleys until you get to the so-called Andräviertel and the Bruderhof Court (next to St. Sebastian). These parts of the city offer a great deal of variety among the two categories described above. A quick look at the people inside, the decoration and the music will tell you which of the two associated philosophies will be followed by the venue in question. Big nightclubs can be found on the outskirts of the city; like everywhere in the world, they seem to co-localise with multi-screen cinemas and shopping malls. The area around the station can be a bit dodgy, but also comes with some nightclubs and noisier bars. During the summer, buying your own six pack of beer and sitting by the Salzach River is among the best things you can do. The 20,000-odd students of Salzburg and a fair share of the city′s youth likes to populate the river banks on warm evenings, especially along the Altstadt between Karolinenbrücke bridge and the Lehenerbrücke, but also at the Überfuhrsteg. Self-made nightlife in Salzburg, in a way.